Fr. Andrew Barakos was born on December 14, 1961 in Berkeley, California. His parents, John and Eva Barakos raised him in Lafayette, California along with two older sisters and a younger brother. After graduating from Acalanes High School in 1980, Fr. Andrew attended Cal State Hayward as a biology major. After making a decision to change his major in 1984, Father Andrew received a calling to the priesthood. He enrolled at Hellenic College, Brookline, MA, in January, 1985. While on staff that summer at the Athenagoras Retreat Center in Cheyenne, Wyoming, he met his future presvytera Andrea Contos from Denver Colorado. Presvytera Andrea holds a Bachelor in Education from the University of Northern Colorado. On December 28, 1986 they were married at the Assumption Greek Orthodox Cathedral in Denver. On May 16, 1987, Fr. Andrew graduated from Hellenic College with a Bachelor of Arts. On May 19, 1990, Fr. Andrew graduated with distinction from Holy Cross Greek Orthodox School of Theology with the degree Master of Divinity. As a seminarian graduate, Fr. Andrew was ordained a Deacon by Bishop Anthony of San Francisco, on March 17, 1991 at his home parish of the Ascension Greek Orthodox Cathedral in Oakland, California. On April 1, 1991, Fr. Andrew received his first appointment to St. Sophia Cathedral in Los Angeles, California. On May 12, 1991, Fr. Andrew was elevated from the Deaconate to the Holy Priesthood on May 12, 1991. Presvytera Andrea gave birth to their first child Evan on August 17, 1992. Fr. Andrew and Presvytera Andrea received their second appointment on March 1, 1995 to serve the Assumption Greek Orthodox Church in Scottsdale, Arizona. On May 3, 1995, Presvytera gave birth to their second son Nicholas. On March 27, 1998, Presvytera gave birth to their third son Alexios. Since 1995, Fr. Andrew Barakos has been the priest of Assumption Greek Orthodox Church in Scottsdale, Arizona. He is currently, the vicar of the southwestern region of the Metropolis of San Francisco. Fr. Andrew is a board member of the Trustees, Hellenic College/Holy Cross Greek Orthodox School of Theology, the Metropolis Council of San Francisco and the Commission on Missions and Evangelism. He is a past member of the Archdiocesan Council of the Greek Orthodox Church. Fr. Jacob Saylor is the Assistant Priest and Youth Director at Assumption Church. Employed since January 2016, Fr. Jacob has worked extensively in field of Orthodox youth and young adult ministry since 2007. An alumni of Holy Cross Greek Orthodox School Of Theology in Brookline, Massachusetts, Fr. Jacob received his Masters of Divinity in 2010. Prior to this, his undergraduate degree was a B.A. (Double-Major) in Philosophy and Religious Studies, earned at the University of South Carolina. Following his theological studies, Fr. 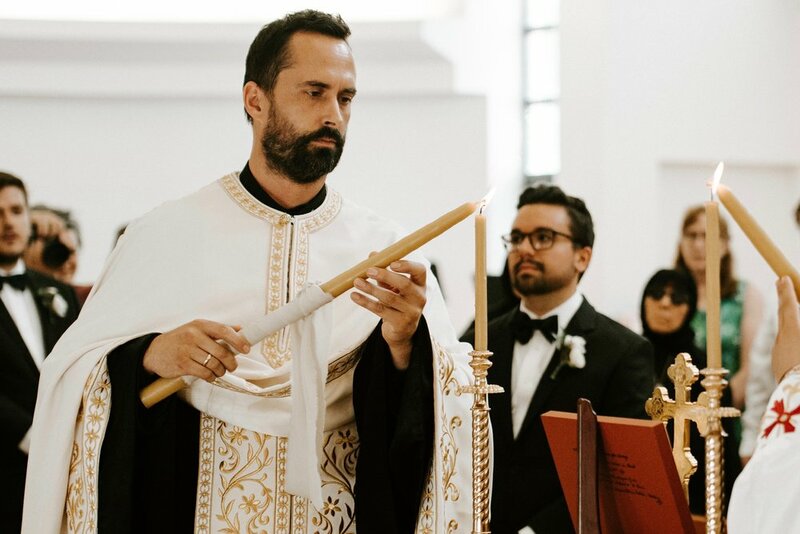 Jacob worked as Youth Director of Holy Trinity Greek Orthodox Church in San Francisco, from 2011-2015, during which time he also served as program director for the Metropolis of San Francisco Summer Camp. While on staff at the Metropolis Saint Nicholas Ranch, he met his future wife Presvytera Jordan. Originally from Modesto, California, Presvytera Jordan earned a B.S. in Anthropology and Geography from the California Polytechnic State University, at San Luis Obispo, and a Masters in Education, at Arizona State University. Invested in ministering to as many youth, families, and young adults as possible, Fr. Jacob has created, developed, and contributed to numerous programs and curriculums across our Orthodox Church in North America, and has been blessed indeed to be further allowed to lead, organize, and guest lecture at various regional, Metropolis, and national youth, young adult, and youth worker events, retreats, and workshops year round.